Last Saturday morning my ten pounds of peaches and forty pound box of apples arrived from the fruit farmer! Hubby’s eyes lit up. He licked his lips in anticipation and I swear I saw some drool escaping down the side of his chin. LOL. One of my Fall rituals each September is a marathon session baking pies. I have my Gramma to thank for that. She taught me how to make pie pastry when I was all of eight years old. Gramma and Grampa lived on a very large dairy farm in northwestern Ontario that my French Canadian grandfather inherited from his father when he died, well into his nineties, in the 1930’s. What a wonderful farm it was! Acres and acres of hay fields, a small fruit orchard and a vegetable garden filled with row upon row of corn, peas, potatoes, beans, tomatoes, cucumbers, parsnips, pumpkin, carrots, squash and turnip. Rows that seemed to stretch for miles and miles. An old fashioned barn for the cows and the horses. A long white hen house for mama hens and their chicks. A building that served both as a root cellar for storing the fall harvest and ice house for cooling and storage of perishables. A mud pit with a fence for Papa Porky, his wife Bess and their squealing little piglets. A hay barn and place to store the wagons and farm implements when the day’s work was done. A rambling, old farmhouse with many tiny rooms, a large attic filled with all sorts of goodies from years gone by (including great-grandfather's fiddle) and a gigantic kitchen with two long tables that probably sat at least 12 people each. 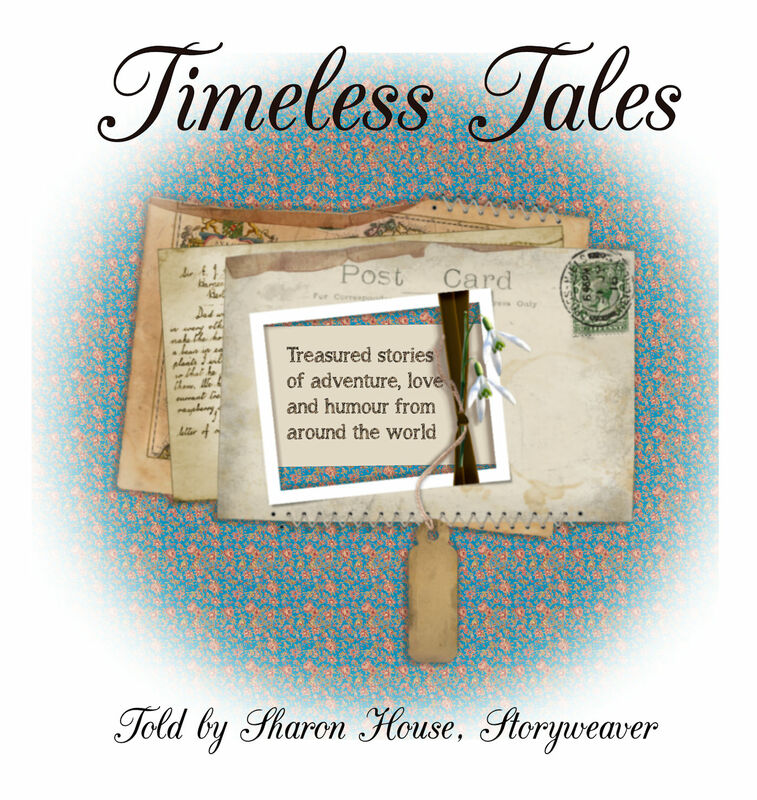 I remember the old rocking chair that sat by the large wood burning cook stove. I was rocked to sleep in that chair on many occasions when I was really little. A water well and bucket just outside the back door. And yup the outhouse was a bit further out in the backyard... with a fancy curtained window in the door no less! A long porch with rockers and chairs for sunset sittin’ and watchin' before bedtime. Grampa was up at 4 in the morning to milk the cows before they went out to pasture. He "hit the hay" pretty early each evening. A miniature "farmhouse" and tiny flower garden filled with pansies, daisies and sweet peas. Such a lovely playhouse built by a proud grandfather (my great-grandfather) for his first granddaughter. It was to this land and home, a handsome young man with a delightful French accent brought his pretty, Minnesota bride to live and raise a family prior to WWI. In the early 50’s Grampa built a modern, new house with a small “tearoom” porch for Gramma just up the road. Gramma just loved her new house even though she complained every now and again that the kitchen was “too small”… she couldn't fit 12-14 people around the kitchen table at one time now! It was in this kitchen that she taught me the “art” of making pastry. For as long as I can remember, I have loved apple pie and homemade ice cream! When we went to visit, Gramma always made sure she had a freshly baked apple pie sitting on the sideboard waiting for me. Grampa, of course, always needed help to finish off churning the ice cream. He needed a “tester” to quickly dip a small index finger into that cold, cold mass of cream and sugar and have a taste. This, of course, was just a “precaution” to make sure the ice cream was really ready. Each summer, my cousin Lanny and I (we are close in age) would get to spend a couple of weeks on the farm with our grandparents just as our three older “girl” cousins (now teenagers) had done when they were our age. Not only would we get to gather the eggs, feed the chickens, pick vegetables and fruit or play in the old playhouse my great grandfather had built but we got to go on the tractor out into the fields with our grandfather or help gramma in the kitchen. It was the highlight of our summer school vacation. During harvest time, the farm bustled with activity and people! The “clan” of aunts and uncles, farmhands, and friends all gathered to bring in the bounty and put it up for the winter ahead. While my mother and her sisters canned fruit and vegetables in the old farmhouse kitchen up the road (it was wired for electricity in the 1920’s), Gramma, aided by her granddaughters, would get busy in the new farmhouse preparing the evening feast for a crowd of ravenous “workers”. Pies, made with a variety of fillings and freshly churned butter, were always on the menu! Each fall, these wonderful childhood memories come flooding back to me. As I put on my apron and get out the butter, shortening, flour, sugar and cinnamon, eggs, cream, pie tins and my gramma’s old rolling pin, I am magically transported back in time to gramma’s kitchen! My grandmother is my kitchen angel at pastry making time. Even though she died suddenly when I was just twelve, I can still feel her presence and hear her voice instructing me in the fine “art” of creating flaky, delicious pastry. Now Sharon, never make pastry on a rainy day. The flour can absorb too much moisture and make it dry. Make sure dear that everything is very cold before you start. The flour, the butter, the lard, the water. Cut the butter and lard (shortening) into the flour until it is the size of the peas in the garden. Mix your pastry as quickly as you can and handle it as little as possible. The heat from your hands will melt the “fat” around the flour and that's what makes pastry tough. We want the heat of a hot oven to do that job! Form the pastry into a nice round ball and pat it down into a circle. Put it in the fridge for 15 minutes to get it cold again. Roll the pastry circle eight times. Once up, then down. Turn the pastry sideways, once up and down. Imagine it is a clock. Put your rolling pin in the middle of the clock. Roll once towards ten o’clock; once toward five o’clock; once toward two o’clock and once toward seven o’clock. That's enough... just practice and you'll soon know how to do it like this. Wind your pastry onto your rolling pin and transfer it to the pie tin. Mix a beaten egg until it is frothy. Add some cream. Now brush the egg wash on the top crust to make a pretty brown top crust once it’s baked. Sprinkle some sugar on the top of the pie just before you put it in the oven It will caramelize on top and it’s very tasty. Bake on the middle rack in a 370 degree oven for 10 minutes, then turn the oven down to 350 degrees. You'll know when the pie is done. It will be lovely and brown on the top. It will burn if you put it on the bottom rack or don't turn the oven down. Last weekend, I doned my apron and had a marathon pie making session ! I made eight peach pies and some homemade vanilla ice cream on Sunday. 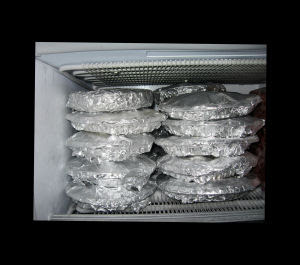 So far this week, I have made another 22 pies… cinnamon apple, cinnamon apple/blackberry and apple/raspberry… all but three of them headed for the freezer to enjoy at Thanksgiving, Christmas and over the winter. Now… if you aren’t into making pastry, here’s an art project for you. But first a humourous little story. 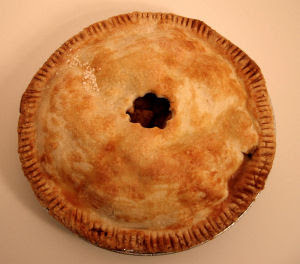 One of my husband’s uncles loves my apple pie and raves about my pastry. I swear that man can smell it all across town because he usually shows up for a "cuppa" (a cup of tea), out of the blue and unexpectedly, just as they are out of the oven and cooling on the counter. One afternoon he stopped by for tea and saw that same pie at the beginning of this post, sitting on my counter. We chatted about this and that and I noticed how he kept stealing a sideways glance at it. But he said not a word about the pie. He drank his tea and nibbled at the cookies on his plate. He waited and waited and waited for a piece of that pie to be offered. Finally he could stand it no longer. “Do you think I could have a slice of that nice apple pie you made?” he said boldly. "Sure," I said. "But I don't think you'll like it. The pastry is rather tough." "Oh, just a little piece will do!" he said, licking his lips in anticipation. Well the jig was up. I told him the truth. He just roared with laughter when he found out it was a “fake” apple pie. He has never let me forget it! Want to try your hand at making an apple pie top? Make a batch of flour and salt playdough. Cut out strips and weave them together to form the top of the pie. 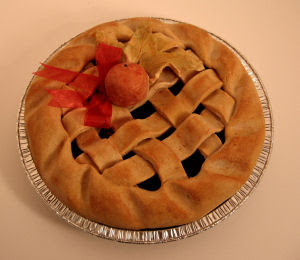 Decorate the pie with an apple and leaves made from the "playdough". Place it on the middle rack in your oven (about 225 degrees) until its dry. This can take some time at this low heat, so just be patient. It will look "cooked" when it's fairly white with no moist spots. Remove it from the oven with oven gloves. It will be hot! Let it cool, preferably overnight, then ink the “cooked” pie crust and apple with vintage ink. Fill the aluminum pan beneath it with cinnamon pot pourri and hot glue the crust to the pan. It will make your kitchen smell wonderful and you'll probably fool your best friend with your newly acquired, fantastic pie making abilities! you weave the BEST stories! you can mail me a piece of that pie thank you very much!!! you are one busy lady! I love, love, love your story about the farm. It reminds me of my grandmother. I haven't made a pie yet this season but I have a bunch of apples sitting here waiting for me. I think I will now! Thanks for the inspiration! i can't make a decent pie crust to save my life - but hey , maybe it's to wet here in hawaii? ha ha! your blog is very entertaining!